I was recently asked to review 'Let’s Celebrate Christmas Additive Free' by mum of 3 Melanie Avery, an additive free recipe book created for the festive season. Now to be honest reviewing a recipe book was pretty nerve wracking for me as I kind of avoid the kitchen at all costs and am also pretty clueless when it comes to additive free but I must say I was pleasantly surprised at how much I enjoyed the task. Here's what I thought. 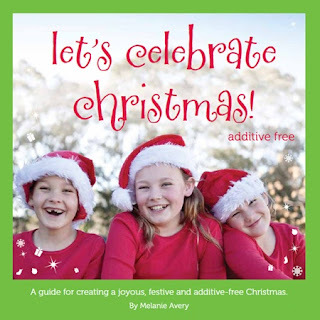 Let's Celebrate Christmas has a great introduction that covers some basic facts about additives, things to be aware of and also healthier alternatives to some common foods. Being someone that knows little about additives and who is often confused about what’s good and what’s not when reading food labels, I found this section really helpful as it was explained in simple terms and set out in easy to read dot points. The recipes themselves are simple and easy to follow, even for the most clueless of cooks such as myself and are great for the kids to help prepare. We have made a few of the recipes so far with the favorites being Rocky Road and Blueberry Pikelets. My kids love pikelets but I wasn't sure how they would go with the blueberries and thought these would be picked out. I thought I would be clever and puree them first, then add to the mix. That backfired as of course the pancake mix then turned blue. Declan was very hesitant to try his as they had ‘black stuff’ through them. However after a little coaxing, these were soon gobbled up and he was asking for more. Additive free and a way to sneak fruit into their diet, win win! Rocky Road was super easy to make and well received of course. What I loved about this recipe was that it also listed alternative ingredients to replace things such as the nuts, which we did. A lot of the recipes offer ingredient ‘variations’ so found this really handy. All recipes we tried were yummy and full of flavour. The thing that surprised me the most about the recipes were that most ingredients are items I had in the cupboard anyway or brands/items that I know and use regularly. It was a misconception of mine that going additive free meant a whole new range of products and brands (that were probably going to cost more and not taste as good) but it wasn't the case at all. Lastly, my favorite part of the book was the section on all the little Christmas traditions and crafts. These were lovely to read and some we have introduced this year into our family. All the little crafts are fun and affordable and this section really added to the family feel of the book. Let’s Celebrate Christmas is the type of book that would get pulled out each festive season so that favorite recipes can be made and enjoyed year after year. It was a lovely read, easy to follow and beautifully presented. Definitely a recommended Christmas cook book. Let’s Celebrate Christmas RRP $30.00 and can be purchased via the Let’s Live Additive Free website.